Note: This post is the first of a two part series. Part II will become available later this week. This specimen, ladies and gentlegerms, has become one of my favorite recent finds. Combining two of the more formative elements of my childhood, gaming and PBS, Matt Crane, aka deviantART’s Gavacho13, has created a gamer cultural masterpiece. Street Fighter (ストリートファイター Sutorīto Faitā, for those who prefer Japanese) is a fighting series of video games in which its players pit competitive fighters from around the world, each with his or her own unique fighting style, against one another. Since Street Fighter debuted in 1987, it has sold more than half a million arcade cabinets and exceeded 33 million units for home gaming systems (XBOX, PlayStation, etc.) globally. The second, and probably most popular edition, Street Fighter II, generated more than $1.5 billion for Capcom alone. Gameplay was fairly straightforward. Players pick their fighter, or combination of fighters in some cases, to challenge another player or CPU (artificial intelligence) in a bloody brawl. The goal? Knock the lifeforce of your competitor to zero, rinse, repeat for the best of three rounds. Button combinations on the controller or arcade would allow players to execute special moves, each unique and distinct for each of the fighter characters. The character variety made Street Fighter stand out from the rest of the arcade games. From Chun-Li, the beautiful and deadly female agent hellbent on revenge, to Blanka, the green-skinned man-beast who could electrocute the snot out of you, the diversity was far more appealing to a gamer than the more generic heroes from concurrent arcade games. At age 12, I’d bike daily to a local grocery store to return volumes of pop/soda cans, each refunding me a 10-cent deposit. Given the fact that my family was chemically dependent on Diet Coke, my weekly cash-in was quite respectable. I could easily pull in $20 to supplement my allowance, $100 if we hosted an after-school event. I’d immediately bike to the local 7-11, where I promptly fed my entire allowance and recyclable refund to the Street Fighter II machine. I primarily played as Chun Li, the fastest, most aeriel-oriented fighter with enormous thighs that could crush a man’s skull. Ryu, the silent warrior-type, or Dhalsim, the mystical yoga master who could breathe fire and extend his extremities to smack an opponent from afar were my backups. I’d spend hours at 7-11, and was once asked to leave after a four-hour stay. I became quite good, and could easily defeat most challengers or the CPU. I even won a local tournament, but that’s a story for a future post. 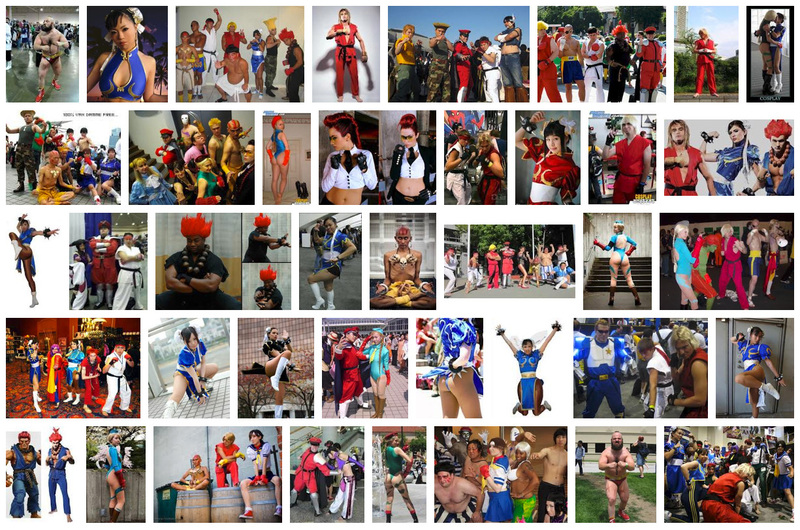 At any rate, I wasn’t alone in my Street Fighter obsession. It became, and remains to be, an important part of gamer culture, including: reprehensible Hollywood films, fan fiction, comic books, clothing & costuming (see below), arts & crafts and more. For digital marketers, understanding Street Fighter and its cultural implications isn’t necessarily going to solve sales slumps. However, I believe tapping into gamer culture is key to reaching and connecting with people online. Gaming reaches more than just 12-year-olds. The average gamer is 37, and has been gaming for 12 years (note: a recent change in methodology has brought this age into question, finding 30 to be the average age). Of course, there are different types of gamers. Again, a future post for another day. Play Angry Birds, Draw Something (heh, does anyone nowdays? That was quick.) or another gaming app on your phone? Congrats, you’re a gamer, too – let the trash talk begin. 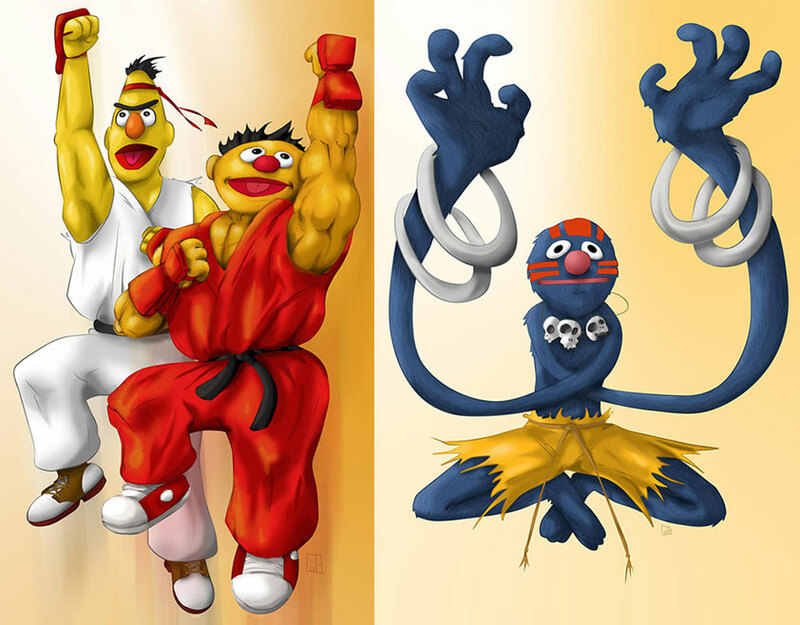 Anyway, my point is this: What Crane has done with Sesame Street Fighter is brilliant. By combining themes from nostalgic cultural icons into a visual/artistic statements, his work connects to fans of both gaming and Kermit & Big Bird. It cuts through the clutter, and communicates to the core of its target audience – all without having to say a word. That, my friends, is the foundation for good, relevant marketing. This entry was posted in Digiculture, Gaming and tagged deviantART, Matt Crane, Sesame Street, Street Fighter, Theme Chaining, Video Games by Jon Beebe. Bookmark the permalink.